Gram flour or Besan flour or Chickpeas flour is a nutty flour has the ability to create tasty, simple breads that stand on their own with few ingredients. It also stands above wheat flour in protein and folate content. Oats being rich in dietary fiber provides a wide range of health benefits. Combine Gram flour, Oats, Semolina, Salt, Carom seeds, Ginger, Green chilli and mix well. In the other bowl mix onion, tomato, capsicum, coriander, chat masala and set aside. The batter turns thick very quickly so keep checking the consistency and add water if required. 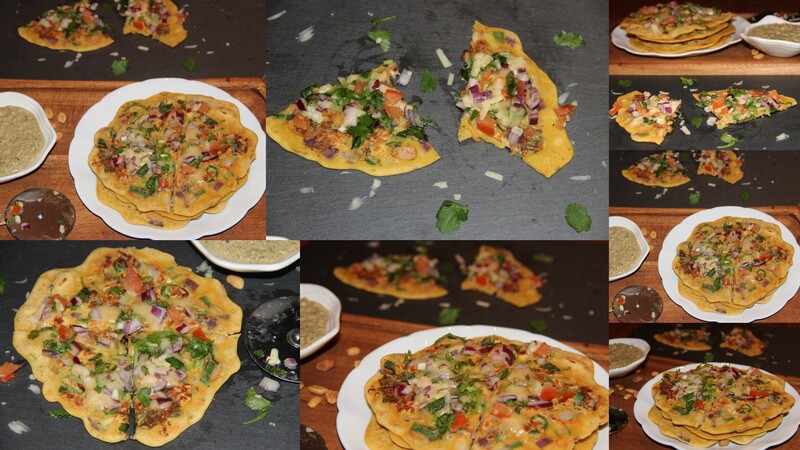 Posted on January 17, 2015, in Appetizers, Breakfast, Indian, International, Main dish and tagged drchdietfood, Gram flour crepes, gram flour Uttapam, indian, oats, Oats spicy crepes, Oats spicy Uttapam. Bookmark the permalink. 24 Comments. Yes my friend with support from amazing people like you…Definitely motivation added at home too…. How do you think of these dishes, Chitra? Great recipe – thank you so much!